For more detailed information about the ComBlock Control Center, please refer to the user manual. The actual configuration resides in each ComBlock in non-volatile memory. It is automatically loaded at power up. Thus, remote configuration is not required once the ComBlocks are configured. Custom monitoring & control applications can also be developed. 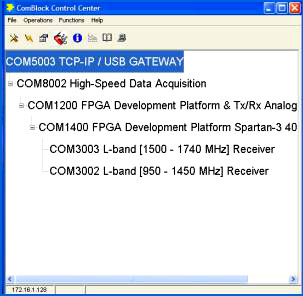 The messages and protocols for communicating with ComBlock modules are described in an API document.